Port of San Diego will be overseeing four aquaculture pilot programs, while Ventura Port District fleshes out shellfish production. SOUTHERN CALIFORNIA — Federal officials declared Pacific bluefin tuna are not on the verge of becoming extinct, but local harbors are still pursuing opportunities to ramp up seafood production in Southern California. At least two port agencies have been actively pursuing opportunities in aquaculture, with the Port of San Diego recently revealing details about four pilot projects and the Ventura Port District aiming to develop production of shellfish in the Santa Barbara Channel. Aquaculture isn’t a new practice. There are fish farms in Mexican waters, just south of San Diego and near Ensenada. Harbors, ports and other policymakers in the U.S., however, are looking into ways to turn seafood production into a sustainable business model. Hubbs-Sea World Research Institute, for example, proposed building a fish farm about 5 miles off the San Diego coast. The farm, if ever approved and operational, would likely produce bass and yellowtail. It’s uncertain, however, when or whether a farm fish would come online within U.S. waters (or what kind of precedent such operations would establish for similar ventures). We quickly look at what the Port of San Diego and Ventura Port District are separately but simultaneously pursuing. 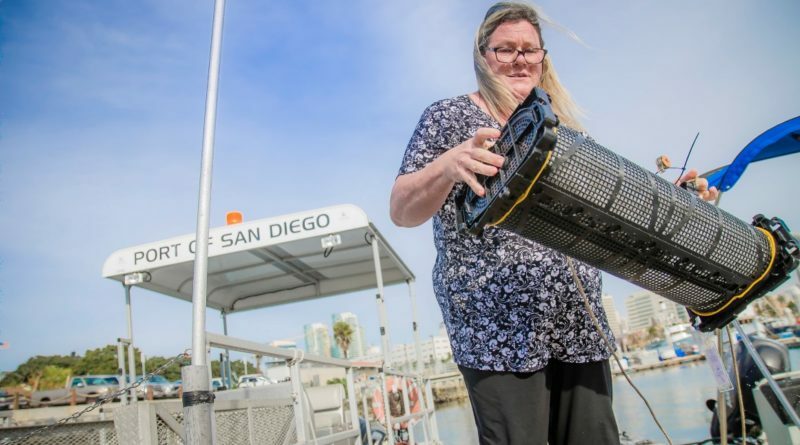 The port district announced in late June it was moving forward with four “Blue Economy” pilot projects, each with the aim of fostering navigation and recreation in San Diego Bay. A floating nursery system known as FLUPSY, for example, would receive more than $350,000 from the port district for shellfish production. Meanwhile $165,000 would be allocated to Red Lion Chem Tech for technology capable of removing dissolved copper from seawater. The development of such technology comes would come at an interesting time for San Diego. Shelter Island in upper San Diego Bay was the first commercial and recreational waterfront in California to be subject to a copper reduction program. The Total Maximum Daily Load (TMDL) mandate to reduce copper levels in the Shelter Island Yacht Basin recently entered its final phase. Also to be tested: in-water boat hull cleaning technology and a mapping tool for marina management. RentUnder would demonstrate the in-water boat hull cleaning technology as part of a two-year, $140,000 agreement, while Swell Advantage aims to refine its mobile phone application – or app – for marina dock management. Swell Advantage is receiving $100,000 for it’s one-year pilot program. A multi-stakeholder initiative has been underway in Ventura, where local officials and interested parties have been working to ramp up shellfish farming on the Central Coast. Ventura Shellfish Enterprise (VSE) hopes to establish regulated bivalve shellfish production in the Santa Barbara Channel. The aquaculture initiative would specifically permit nearly two-dozen 100-acre plots near Ventura Harbor to grow Mediterranean mussels. VSE’s partners are Ashworth Leininger Group, Coastal Marine Biolabs, The Cultured Abalone Farm and Ventura Port District. The Ventura Port District received $300,000 as part of a National Oceanic and Atmospheric Administration (NOAA) and California Sea Grant award. Ventura Harbor and the surrounding area is an ideal area for mussel farming, according to VSE. Cultivating mussels in coastal Ventura County, as is commonly argued by aquaculture proponents, would accommodate consumer interest in locally sourced foods and reduce reliance on seafood imports from distributors on the other side of the Pacific Ocean.